Takis Nitro Habanero & Lime by Barcel are delicious fried corn snacks rolled up like a small taco (smiliar to the deep fried taquitos) covered in habanero and lime. 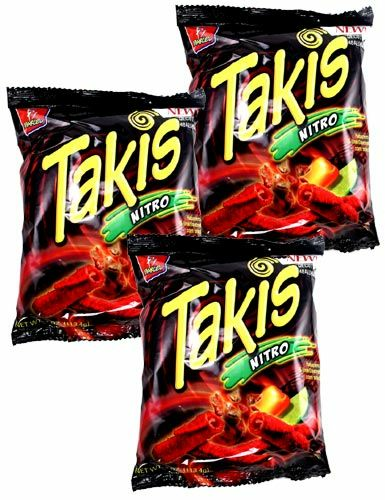 This snack is way hotter than Takis Fuego, so If you love very spicy snacks then Takis Nitro tortilla chips by Barcel are for you. Get Real...Crunch This! Ingredients: Corn Masa Flour, Palm Oil, Seasoning (Maltodextrin (Corn), Salt, Citric Acid, Dextrose, Monosodium Glutamate, Sugar, Onion Powder, Natural Flavoring, FD&C Red #40 Lake, Garlic Powder, Gum Acacia, Yellow 6 Lake, Yellow 5, Tocopherol, Mannitol, Blue #1 Lake and Nature Identical Flavor) Contains 2% or less of the following antioxidants (TBHQ and/or BHA and BHT) and Lime Traces. Es una deliciosa botana de maiz frito enrollado como un taquito (parecido a los tacos dorados) cubiertos en habanero y limon. Esta botana es mas picosa que Takis Fuego, asi que si te gustan las botanas picosas entonces Takis Nitro de Barcel es perfecta para ti. El nuevo sabor habanero y limon Extremo de Takis Nitro esta que arde! I'm a certified takis lover for life, my comfort food. The most delicious chip I've ever had, but fuego and nitro are my favorites right now. I will try others gradually. It has been 6yrs of pure love. �Ÿ‘�Ÿ‘�™��™��Ÿ™�Ÿ™�Ÿ™. ProsNeeds to be sold at all Caribbean islands also please. Thank you.